The ride itineraries for 2010 include opportunities for great adventure riding and the chance to reach out to villagers in new areas. Please see our itineraries for more exciting details. "I have traveled to many exciting, and beautiful and interesting places: the Sahara, Mongolia, Ireland, Russia, Patagonia, and New Zealand. My RRI trip in October 2005 was without a doubt the most fascinating, exciting, interesting and rewarding trip I have ever taken." One of the most powerful, inspiring and often overlooked rewards of Relief Riders International has been experiencing the ripple effect of our riders work/experiences after they return home. Some people express finding their careers revitalized, others have found deeper levels in their personal relationships, and there are those for whom the experience served to kick start a life changing dream project. Almost all of them have been inspired to continue to help others. Andrew inspired by his experience on the Relief Ride returned home with a new perspective and within 12 months manifested a beautiful and purposeful book project. Andrew is the author of Frommer’s "500 Places Where You Can Make a Difference". A book to inspire travelers to recharge their lives, makes new friends, and be a global goodwill ambassador—through Voluntourism. Andrew states, “In my field of travel writing, the description “life-changing” is bandied about loosely, but I could not be more sincere when I say this trip (February 2007 Nagaur Relief Ride) changed my life. 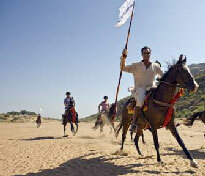 Join us on what promises to be a fantastic journey through the Desert of Rajasthan this winter. There are a few spaces left on both of our Relief Rides. I hope all of you are well. We look forward to hearing from you.